Select A Mandala and Read Its Hidden Message For YOU! Choose any of these six Mandalas, whichever you find the most appealing, then read to find out what the hidden message is inside this Buddhist and Hindu symbol of the metaphysical cosmos. Mandalas have long held mysteries deep inside their intricate patterns and they symbolize the universe. Each one has a different hidden message. 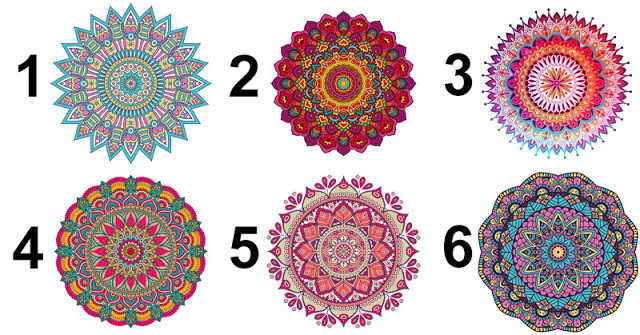 Pick the Mandala you like the most and be inspired by the message it brings. You are someone who always strives to do the right thing, while still getting what you need out of the situation. You tend to go all out when accomplishing a task, or doing something nice for a loved one. Occasionally, you feel under appreciated, and as if no one sees the hard work you put in. You are guided by a strong sense of what is right, and what is wrong, and you are always someone who is always willing to take a risk. You are someone who is always honest, no matter how much it may hurt. You understand the value of always telling the truth, and are known for your honest opinion regarding all things in life. Because of your blunt honesty, you are able to form real, and lasting relationships with those who look to you for advice. You are also genuinely interesting, you have the best life stories, and always are able to make yourself, and a room full of people laugh. You are someone who is always thinking of others, and always paying attention to the needs of others. You are always willing to expand your mind, and learn a new skill. You are always on top of things, and the first to know something. People come to you for information and advice. Though you get along well with almost everyone, you have the unique ability to engage in proactive and thoughtful debate with those of different philosophies than you. You are known for your one-of-a-kind and unique personality, you make an impact on everyone you meet. You are known for your cleverness, you are always able you sneak your way out of something or able to tell just the right tale to get out of some requirement. There is no one else like you, you are as unique as they come. You are creative, and are able to use your cleverness to create works of art that accurately depict your life. You are assertive, and know exactly how to get the things you need in life, you are also courageous, and know just how to use your courage to further yourself. You are independent, and know what you want in life, if you don’t already have something, you go out there and get it. You know exactly how to assert yourself, and know that a little bit of courage, and some assertion will yield you everything you want in life. You are just the right mixture of responsive enough to pick up on other peoples emotions, but gentle enough to respond in the right way. Because of your gentle and responsive abilities, you do well in social settings, and have a large group of friends who look up to you when things get rough. People always look to you for advice, because you always know exactly what to say. However, don’t mistake your gentleness for someone who you can mistreat, you will always stick up for yourself, and others.